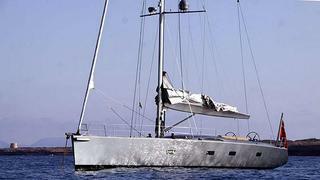 Jim Acher at bluewater tells me there's been a €140,000 price drop on the petite 20m sailing yacht Gymir. Gymir accommodates six guests in a master and two twin cabins and is powered by a single 125hp Yanmar engine giving her a cruising speed of 8 knots and top speed of 9 knots. Lying in Palma de Mallorca, Gymir is down from €1.29 million to €1.15 milion, VAT paid.